Our award winning crop management software is used by thousands of growers from all over the world. Croptracker’s award-winning record keeping system lets you and your team share and create with ease from your smartphone, tablet, or computer. 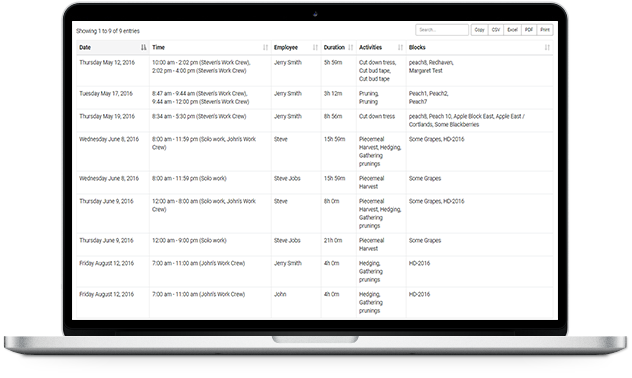 Quickly record spray, harvest, and employee time sheet data, and analyze costs by block or commodity. Croptracker is a powerful, web-based record keeping system for growers. The integrated orchard mapping feature creates a highly visible, dynamic interface for spray records, harvest, etc. Eastern Growers will love the Knouse-format spray report! Using Croptracker over the last two years we have seen substantial buy in from our 40 farms, and from our SQF auditor. Technical support has been excellent, the learning curve short, and resulting information very useful. Having our growers packing with Croptracker has been a real advantage because we can see in real time what they're packing and make better logistics decisions to fill our orders. Why Use Farm and Crop Management Software? Crop management software is designed to help improve productivity and operational efficiency. Almost effortlessly, it allows growers to keep and store accurate records, monitor their team, keep tabs on their chemical applications and chemical inventory, and schedule and manage their production practice events. It also provides the real-time data growers need to make the right decisions at the right time. Using crop management software allows growers and farm employees to easily view their costs of production, from the initial planting to field work, spraying, crews, harvesting, packing, and shipping. When a grower has access to accurate data on all aspects of the business, making decisions that increase profitability are simple. Without accessible, real-time data, it is challenging to find ways to increase operational efficiency that lead to increased profits. One of Croptracker's primary objectives was to help users improve their profitability. 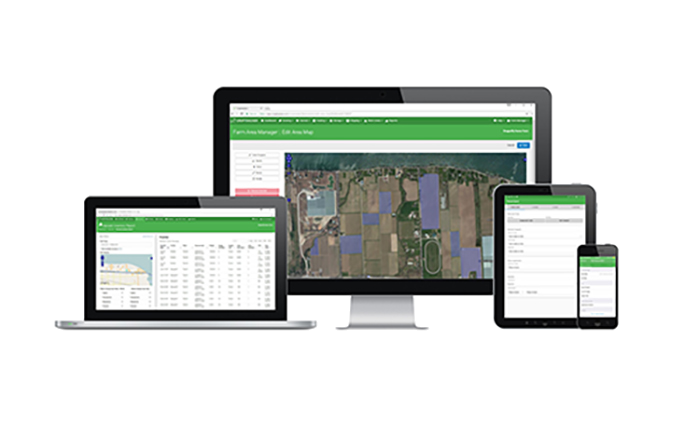 As a simple, easy-to-use cloud-based platform, Croptracker helps increase efficiency, reduce costs, and increase profit margins. With Croptracker, growers can schedule and record tasks and view an overview of everything that is happening on their farm. This bird's eye perspective makes accomplishing goals and managing teams easier. Croptrackers' labour productivity reports can also help growers track trends and identify areas for improvement in their team set-up. Croptracker offers mobile apps for both iOS and Android - after all, growers don’t stay in front of their computers all day! Mobile support means growers can spend less time in their offices and more time in their fields and orchards. As a cloud-based solution, Croptracker gives farmers and workers real-time dashboard access. 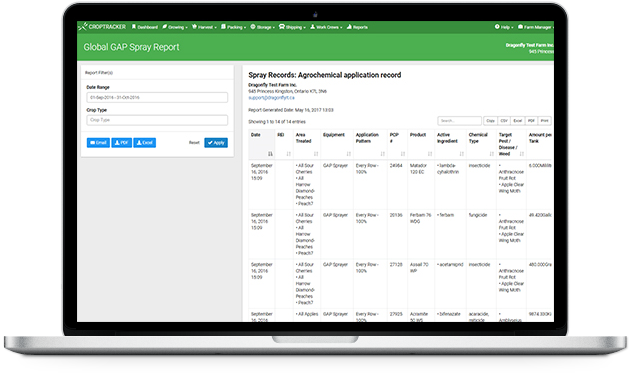 If a team member in the back forty inputs information about spray records, crop health, or orchard management, all employees with access have that data at their fingertips instantly. Whether growers are out in one of the fields, in a storage barn, driving a tractor, or even in town picking up supplies—whenever and wherever data is needed, as long as there's an internet connection, Croptracker is there. Accessing your records and data couldn't be easier. The cloud also eliminates the headache of storing, sorting, and retrieving physical records. With Croptracker, all your records are stored securely in the cloud and are accessible to users in a few clicks or taps - no matter how old the record and no matter where the user is located. This frees up office space and makes surprise audits and record requests less daunting. All data stored on Croptracker is safe, secure, and reliable. All Croptracker accounts use SSL-encrypted connections - the same level of security used by online banks. You never send or receive sensitive information in plain-text. Additionally, industry-standard physical and remote security is administered at data center facilities. We care deeply about our user's privacy and will never share or sell your information. Our cloud-based system also means that your records and valuable data insights will not be lost or compromised if your computer or smartphone gets lost or broken. Backups occur every hour, get replicated across 3 continents, and are retained for 180 days. 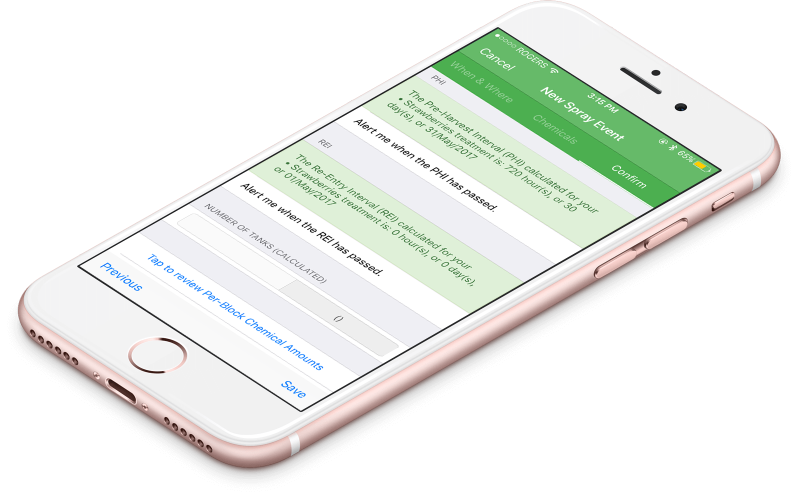 When Croptracker was in early development and we asked growers what tasks they would most like to streamline, one answer we heard most often was food safety audits. 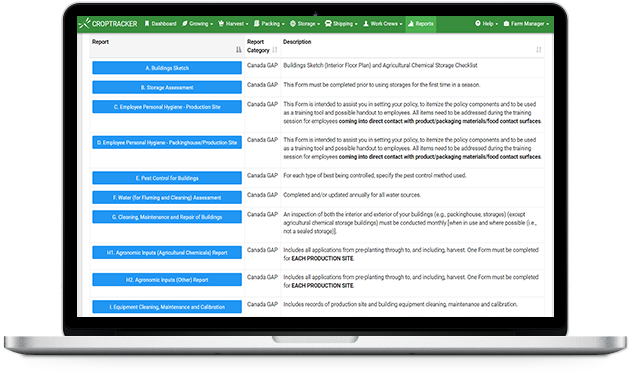 Today, Croptracker's reports - developed in close consultation with growers and auditors - help users shave days of effort off the auditing process. Croptracker's easy record-keeping system and over 50 generatable reports makes passing audits easily. 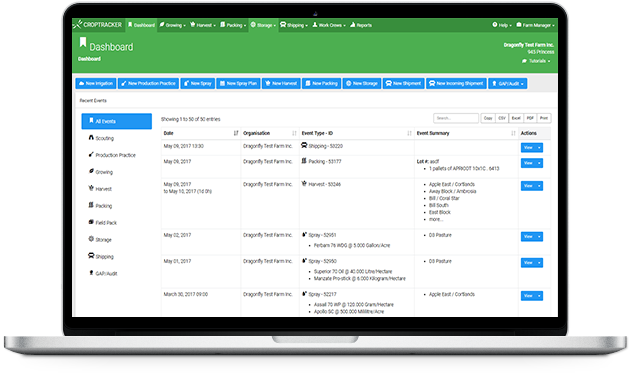 On audit day, growers can generate the necessary reports in a few clicks or taps and get back to their daily tasks sooner. 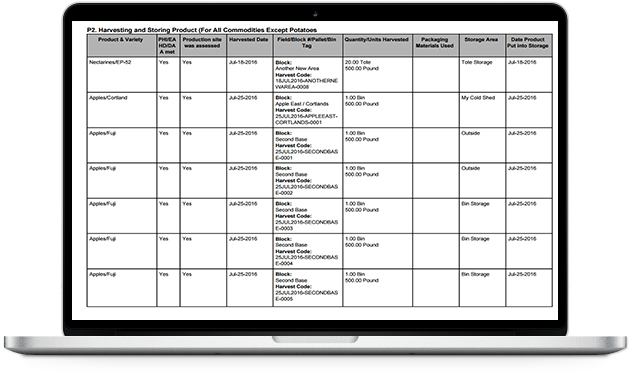 Our comprehensive crop management software enables tracking of products right from planting through sprays, harvesting, packing and shipping with a simple event system. In fact, Croptracker tracks a billion pounds of produce annually. With Croptracker, growers can trace a product back to the exact originating block and responsible person. Having this information at one's fingertips significantly reduces recall time, helping keep consumers safe and a farm's reputation intact. Spray records are required by an increasing number of processors and retailers, so it is vital to have these records accurate and easily accessible. Croptracker makes this easy: simply input or schedule spray applications, auto-calculate how much chemical is needed and PHI and REI times, choose from preset tank mixes, and let Croptracker automatically update your chemical inventory based on your applications and purchases. You can even receive notifications when the PHI and REI intervals end, and be warned if you try to schedule a production practice in an area that is not yet safe for entry. Harvest records are simple with Croptracker, too. Growers can quickly record their harvest and packing statistics as they are completed without leaving the field, orchard, or packhouse. From block yield reports, inventory tracking, product inventory, packing and shipping reports, chemical inventory, spray reports, to packaging material inventory—everything is available from a real-time dashboard. Growers work hard, and it is challenging to keep profit margins high. Croptracker helps by harnessing the power of data to make growing produce more efficient, more productive and more profitable.